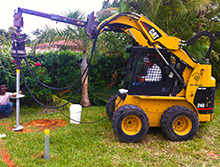 Helical piles are ideal for new construction & remodeling projects to be built on unstable soils. 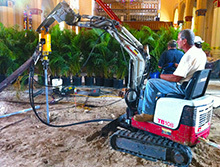 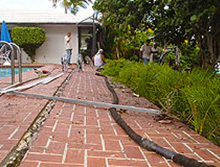 This environmentally friendly system provides a clean and quick installation procedure to keep projects on schedule. 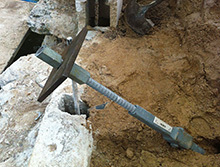 A hydraulic gear motor mounted on a skid steer or mini-excavator is used to screw the hot dip galvanized helical pile through the soil as torque is monitored to achieve required load capacities. 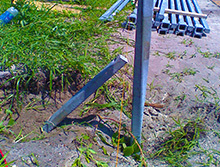 A steel plate is then welded on top of the pile and encased into the new concrete foundation. 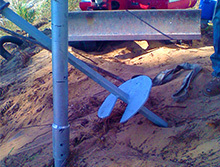 The pile can be loaded immediately. 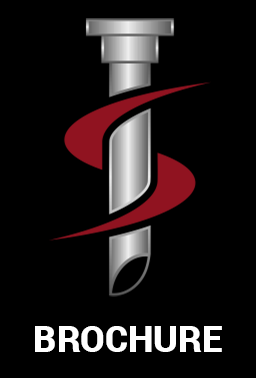 Applications for helical piles include home additions, swimming pools, privacy walls, concrete slabs / decks, generator pads, underpinning existing foundation, retaining walls, reinforcing existing foundation for second story addition, etc. 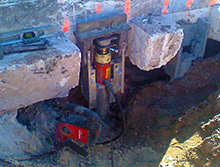 Load capacities up to 20 tons design are possible with geotech’s approval. 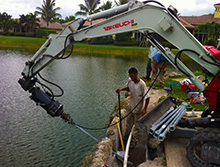 Even higher loads can be achieved with Helical Micro Piles. 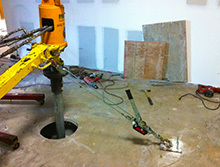 Minimum accessibility from 30" to 6' wide makes helical piles an ideal solution in tight areas. 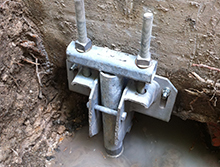 Helical piles can also be used in conjunction with brackets to underpin existing concrete foundations to either stop settlement or reinforce for additional loading. 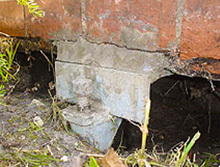 In some cases, hydraulic jacks can be manifolded together to simultaneously raise the foundation to close cracks, level out floors and help to restore property value. 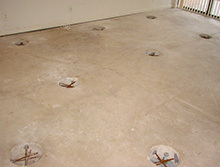 An inside or outside concrete slab that has settled can be saved using this system. 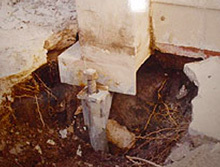 The slab is core drilled on approximately 5' centers to allow the installation of a helical pile in conjunction with a galvanized steel channel to support the slab. 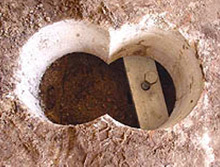 If possible the slab is then strategically raised and stabilized to its original level. 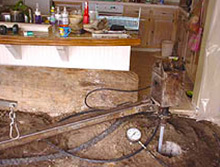 In some cases this can be achieved without having to move out. 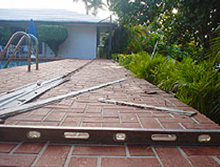 This pile system is ideal to stabilize or raise the perimeter of a slab that has settled. 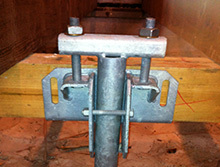 A helical pile is installed adjacent to the slab with a low profile galvanized bracket to underpin it. 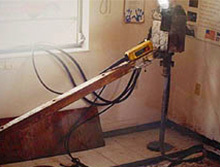 No cutting of the slab is required. 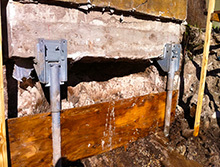 Helical tieback anchors are anchoring systems used to horizontally reinforce and stabilize permanent and temporary structures subject to lateral loads from earth and water. 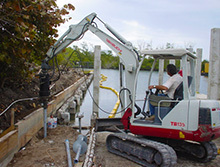 These can be used in conjunction with sheet piles or encased in concrete for seawall bulkheads or retaining walls.